The Southeastern Pennsylvania Transportation Authority (SEPTA) is the public transportation authority within the Philadelphia region. SEPTA is responsible for allowing citizens with Philadelphia to travel within the five counties that it currently serves. However, like some transportations services, there is always the risk that you may become involved in an accident and sustain injuries. If you were involved in an accident and SEPTA was the operating party you should reach out to a car accident attorney in Philadelphia and receive a free case review. 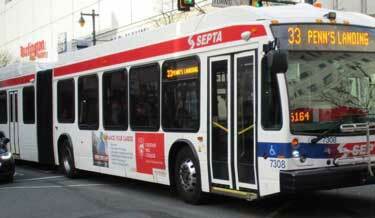 Our Philadelphia SEPTA accident lawyer represents people injured in SEPTA bus, train, trolley, and subway accidents. SEPTA accident cases can be extremely complex. This is due, in part, to the partial immunity granted SEPTA as a governmental agency. As a governmental agency, SEPTA is governed by the Pennsylvania Sovereign Immunity Act. Damages in SEPTA accident cases are also capped under this law. SEPTA’s liability is limited to $250,000 per injured person and a total of $1 million for each SEPTA accident. SEPTA accidents can result in significant injuries or death to SEPTA passengers, occupants of other vehicles, and pedestrians. SEPTA has installed surveillance cameras on its buses, trolleys, subways, and trains. While the cameras were intended to identify fraudulent claims, they frequently enable our Philadelphia SEPTA accident lawyer to obtain crucial evidence regarding a client’s case. SEPTA accident victims are also subject to strict notice requirements of a victim’s intent to sue. Before filing a negligence claim against SEPTA, an injured party must notify SEPTA of the accident and intent to sue within 6 months of the accident. This notice is given by filling out a form provided by SEPTA. SEPTA can be liable for passenger injuries caused by SEPTA’s negligence on a moving train, subway, bus, or trolley. The agency can also be liable for passenger injuries negligently caused by moving parts of SEPTA vehicles, such as an opening or closing door. Note: The manner in which damages are collected by injured SEPTA passengers may depend upon whether the passenger owns an insured motor vehicle or lives with someone with vehicle insurance. Pedestrians are the most vulnerable of SEPTA accident victims. Accidents involving pedestrians and large vehicles such as buses or trains frequently result in death or life-long, catastrophic injuries. Were you injured in an accident involving a SEPTA bus, trolley, train, or subway? Our Philadelphia SEPTA accident lawyer can help you obtain the compensation you deserve. Contact us today for a free case evaluation of your case.